Who is Venezuela's rival president? Juan Guaidó is touring Venezuela this week, meeting with journalists and citizens. But while Canada acknowledges Guaidó as the official president of Venezuela, Nicolás Maduro says the job is still rightfully his. The CBC's Adrienne Arsenault and Evan Dyer on the latest from Caracas. 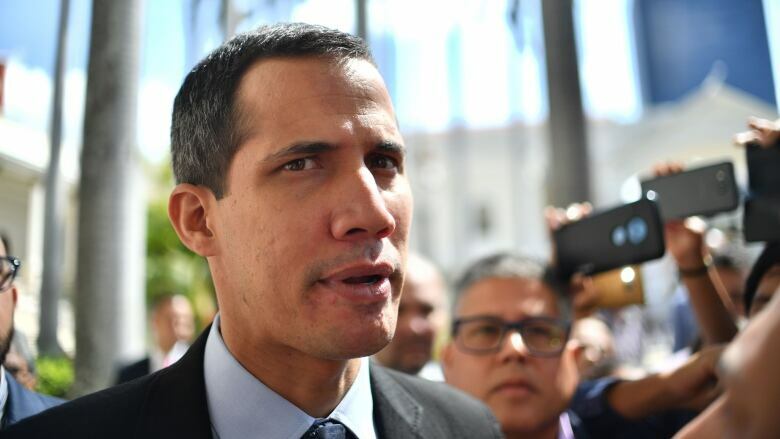 Juan Guaidó is touring Venezuela this week, meeting with journalists and citizens. But while Canada acknowledges Guaidó as the official president of Venezuela, Nicolás Maduro says the job is still rightfully his. The CBC's Adrienne Arsenault and Evan Dyer on the latest from Caracas. They've been reporting on how the country is in the middle of food shortages, power cuts and widespread protests, with no clarity in sight on the political situation. "I don't think there's a precedent for this," says Arsenault. "We might be in brand new territory here."